TCM has been paying tribute to Kelly all day as part of their Summer Under the Stars lineup, and a review of Cover Girl, one of my all-time favorite Gene Kelly movies, is how I will salute him here. In addition to the Gene Kelly classics An American in Paris and Singin’ in the Rain, this beautiful treasure of a film deservedly occupies a prime spot in tonight’s schedule. Initially conceived as a showcase for Rita Hayworth, Columbia’s shining star, the film’s plot revolves around a chorus girl, Rusty Parker, who through a series of circumstances wins a spot on the cover of a magazine. It turns out that she looks exactly like her grandmother, who 40 years ago had had a romance with the magazine editor. She is reluctant to leave her job as a chorus girl, due to her relationship with the club owner, Danny Maguire (Gene Kelly), but Danny doesn’t want to hold her back, so he picks a fight with her so she will accept the magazine cover job. She eventually becomes a big star and becomes entrenched in her fame, but links to her humble roots keep drawing her back to Danny. The supporting cast features some of the best character actors around, notably Phil Silvers as another performer in Danny Maguire’s nightclub, and Eve Arden as the magazine editor’s wisecracking assistant. They add a much-needed touch of wit and sarcasm to the mix–without them, I think, the story would be too flat to work as well as it does. 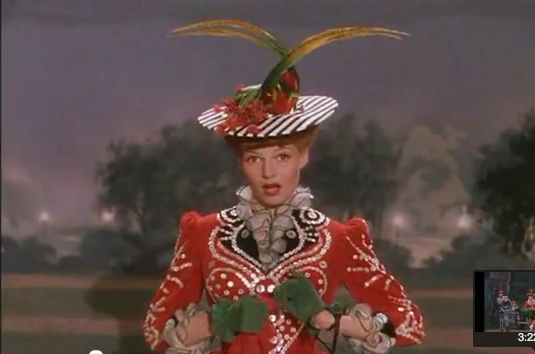 Rita Hayworth is in her element in this movie, outfitted in fantastic gowns by Travis Banton and lit by some of the loveliest Technicolor ever used up to that point. There is, however, one scene that always makes me cringe for Rita–at one point, upon learning that the magazine editor wants a quiet model, a jealous chorus girl makes Rusty pretend to be jumpy, spastic, loud, and obnoxious character and tells her that’s what the magazine is looking for. Knowing the story of Rita Hayworth and her shyness, how she struggled in her early years simply to be heard on film, often breaking down in tears of frustration, I can only imagine how extraordinarily difficult that scene must have been for her. Every time I watch it, I feel a little bit of anger at the cruelty of making Rita play that scene. 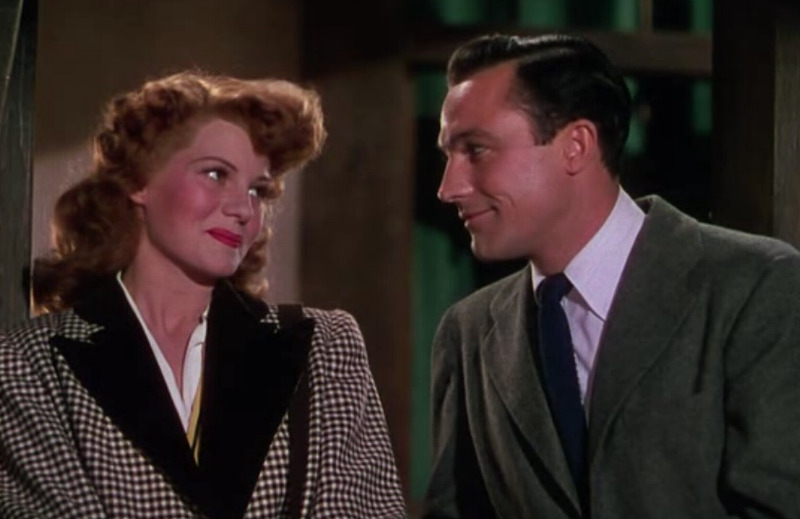 However, I can’t get too mad at the director (Charles “King” Vidor), because obviously he and Hayworth worked well together–two years later, he directed her in her most famous and celebrated film, Gilda (1946), an incredibly different film necessitating a completely different approach. “King” Vidor’s direction of Gilda. 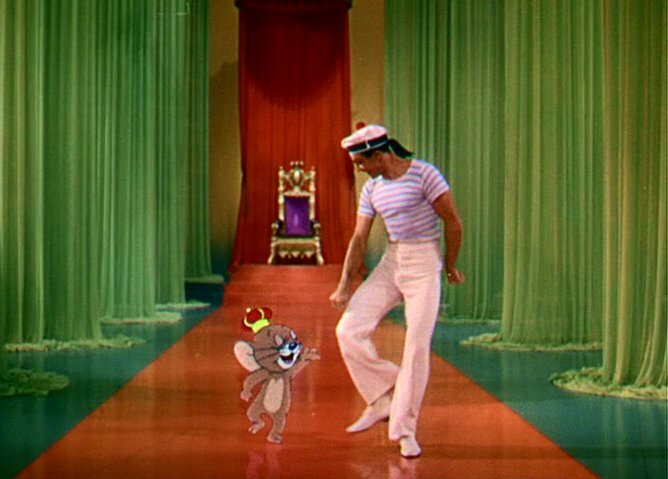 As for Gene Kelly, this was the true beginning of Gene Kelly’s career as a star. He made his film debut only two years earlier, in the Judy Garland musical For Me and My Gal (1942), and his career had been on a steady rise, but it wasn’t until this movie was released that his fame began to skyrocket. One of the highlights of the film is a cinematic trick that would be the first, but certainly not the last, experiment in stretching the limits of film in Gene Kelly’s career–a dance with his own alter-ego. This film achieved far more than its goal–if Columbia simply wanted to make a box-office hit to cement the star power of Rita Hayworth, they got their wish. But in the process, the success of the film served as a springboard for one of the most important figures in all of film. For that, we owe Cover Girl a lot. Very nice post! 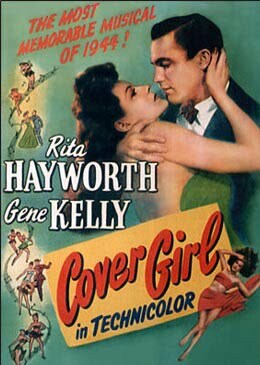 “Cover Girl” really is Rita’s show (with a dancing genius thrown in for good measure). Gene’s rendition of “Long Ago and Far Away” gets me every time. Enjoyable post of an enjoyable film. I’ve always liked this one and Rita looks gorgeous in color. She and Gene make a handsome couple! I also, love this film and would love to see it on the “big screen”. I saw it on the big screen at the TCM Fest. Robert Osborne is obsessed with it, and I actually talked with him about it when I met him. It is BEAUTIFUL on the big screen, as you might imagine. I’m sorry it took so long to get over here for your Blogathon contribution. Really nice! I had no idea about Rita’s shyness etc. As you pointed out. Maybe her relationship and trust in Vidor helped her through what was an uncomfortable scene. This isn’t one of my favorite Kelly films but I liked him with Rita and this is one of the few musicals that I didn’t want to fast forward. I’ll attribute that to Vidor and a decent script. Another thing that made me enjoy the film was how natural. attractive Kelly and Rita were together if that makes sense. Rita with Astaire was always such an odd fit for me. Thank you, Page! Yes, Rita was painfully shy. Louella Parsons recalled that when she first met her as a teenage dancer, Rita couldn’t look her in the eye, and her voice was so soft that she could barely be understood. She worked extremely hard on her voice when she got into movies, but by all accounts it was really hard for her, and she remained very, very shy for the rest of her life. That’s why there are only 2 or 3 interviews with her over the course of her entire career. Interesting thoughts about Vidor, there is probably some truth to that! I agree, the styles of Gene Kelly and Rita seem to jive more than Rita and Fred. She was such a sensual dancer (product of her early training), and it works better with Gene’s athleticism than with Fred’s dapper elegance.